The Donoussa area is ideal for touring with a sailing boat as, besides its fragmented coastline and inlets, a number of rocky islets around it have been officially designated as of particular natural beauty (Makares, Moschonas, Skoulonissiand Melantii). In Stavros bay, on the island’s western coast, where the port is, one can anchor offshore in good holding ground with adepth of 4-5m. On the inside of the pier where ships dock there are few mooring positions and depths are shallow (1.5-2.5m. ), suitable only for small boats. The bay is generally pleasant but not adequately sheltered from strong winds. 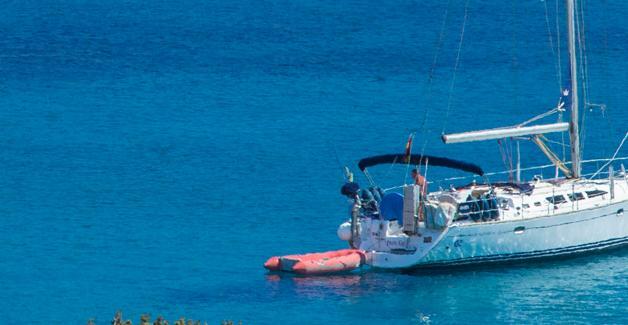 Offshore you can replenish your water supplies and find grocery stores, cafes and tavernas. Dendro (or Kedros) bay, east of Stavros, offers better protection from northerly winds but is still affected by strong gusts. At Cape Dendro, in the middle of the western coast of the bay, there are reefs while the inlet hosts a shipwreck at a depth of about 5m. You can anchor offshore at depths of 5-8m., with a sandy but good holding ground. At the island’s northeastern tip, Roussa or Kalotaritissa bay offers a relatively good refuge from northerly winds. It is better to anchor well inside the inlet on the western coast, at depths of 8-10m.with a relatively good holding.